In the 5th century BCE, Herodotus wrote the first known history to break from the tradition of Homeric storytelling, basing his text on empirical observations and arranging them systematically. 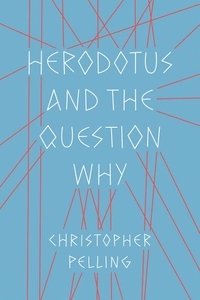 Herodotus and the Question Why offers a comprehensive examination of the methods behind the Histories and the challenge of documenting human experiences, from the Persian Wars to cultural traditions. In lively, accessible prose, Christopher Pelling explores such elements as reconstructing the mentalities of storyteller and audience alike; distinctions between the human and the divine; and the evolving concepts of freedom, democracy, and individualism. Pelling traces the similarities between Herodotus's approach to physical phenomena (Why does the Nile flood?) and landmark events (Why did Xerxes invade Greece? And why did the Greeks win? ), delivering a fascinating look at the explanatory process itself. The cultural forces that shaped Herodotus's thinking left a lasting legacy for us, making Herodotus and the Question Why especially relevant as we try to record and narrate the stories of our time and to fully understand them.